Our new home provides our community with an innovative approach to children’s health care, where complex medical and surgical care is blended with a peaceful environment. The building is 334,000 square feet, with nine-floors and 165-beds. All patient rooms are private, except for seven twin rooms in our Neonatal Intensive Care Unit, and have beds for parents. The hospital’s family spaces are meant to feel like home. There are three family lounges with kitchens, five playrooms, a classroom, a teen center, an art therapy studio, a theater, a wellness center for parents and families and a terrace garden. Our Children’s Emergency Department is more than twice its current size and is completely separate from adult emergency care, including the entrance. The department is staffed 24 hours a day by doctors and nurses who specialize in children’s emergency care. 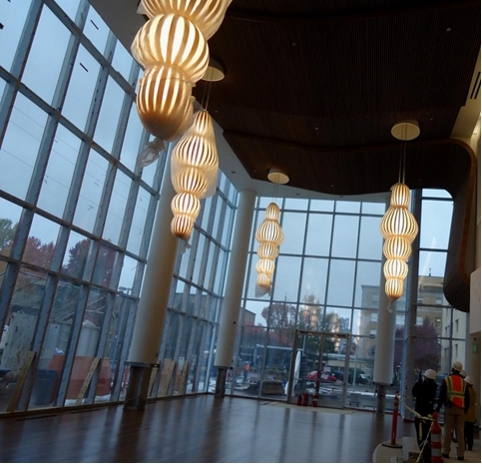 Randall Children’s Hospital contributes to neighborhood development and sustainability. N. Gantenbein Avenue has been improved with new lighting, landscaping and walkways; improving the connections to our neighborhood. Dozens of sustainable design features have been incorporated into the building and landscaping, including bio swales on N. Gantenbein Avenue, rainwater collection on the roof to create a fountain in the Terrace Garden, the use of bamboo throughout the building and very large windows bringing natural light into our units. legacyhealth.org/newhome and follow us on Facebook at facebook.com/legacychildrens. As a long time patient, Randall’s Children’s Hospital has to go, Keep it’s original name EMANUEL’S CHILDREN’S HOSPITAL!